A range of products to assist in cleaning up spills such as cleaning chemicals, oil and other fluids. You will also find specialist products designed for biological spills such as blood, vomit or urine. The super absorbing polymers inside the cloth transform the liquid int.. 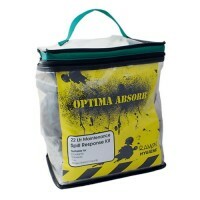 The Optima Absorb Maintenance Spill Response Kit is specifically desig..